Not being a slave to rock ‘n’ roll, I’ve listened, puzzled, to people exclaiming that a certain rock band or music genre saved their lives. I’m equally flummoxed at the notion that any single music artist could be dubbed “the voice of a generation”—there are, after all, so many voices and the most deserving frequently fail to receive widespread attention. Nevertheless, fame places crowns upon a few–that some musicians end in tragedy only serves to superglue that dubious diadem upon the troubled rocker’s brow. Such is the life and music of Kurt Cobain. 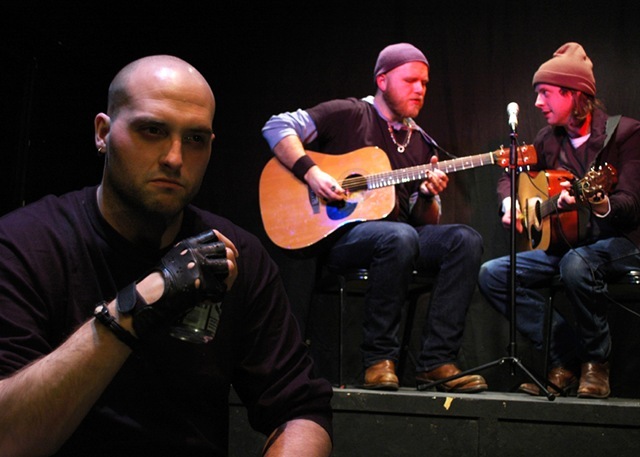 Tympanic Theatre’s latest production, Verse Chorus Verse, pulls its audience into the milieu of grunge fans, reporters and revivalists marked by Cobain’s death. It’s as if, from the moment he pulled the trigger, time stopped and all hope of going forward was lost. Actually, Randall Colburn’s interesting new play, under Kyra Lewandowski’s direction at the Side Project Theatre, begins at a far earlier point in the Cobain legend. Fourteen year old Polly (Victoria Gilbert) gets kidnapped, raped and tortured by Gerald Friend (Neal Starbird ), who lures her into his car after a punk rock concert–the very same Polly becomes the heroine of Nirvana’s eponymous song on their album “Nevermind”. Flash forward twenty years later, the older Polly now fascinates Garret Leskin (Kevin Crispin), a budding grunge star heralded as the new Cobain, who thoroughly believes that Cobain was murdered. The play’s structure oscillates between the past and present, between that fateful kidnapping and its emotional reverberations far into the future. For all the dialogue around Cobain and the burden of living up to his legend, the story really belongs to Polly. Gilbert gives a passionate edge to her role’s pathos. Polly is drug-addicted, trapped in the past, and, since becoming enshrined in Cobain’s lyrics, hardly able to see beyond the boundaries of her own legend. The murder mystery that Garret hopes to unravel through her is tangled in half-cooked fictions, inchoate emotional desperation and age-old resentments over who got fame and who got left behind. Dennis Frymore puts in a tough, grilling performance as Mason Dwyer, lead of the Satanic Metal Band, Yeti, who has lost his guitarist Terry (Jon Patrick Penick) to Garret’s up-and-coming band, Samsara. Lewandoski’s direction also hangs pretty tough—making the most of the black box at Side Project with a spare but versatile set by Dustin Pettegrew. She squeezes every moment for tension and suspense from her cast, shifting between scenes where rockers spar over competing narratives and otherworldly scenes in which Polly survives her kidnapping by Friend, moment by moment, under a starry sky. This doesn’t mean Verse Chorus Verse is perfect. A few fellow audience members confessed to being confused over its alternating shifts between past and present. Plus, the show will obviously carry more meaning for viewers steeped in rock culture. But both the work and production show sophistication, even with its characters’ simplistic pre-occupation with fame. Everyone just wants to be remembered, even Mr. Friend, in a chilling performance by Starbird, tries to be remembered by leaving his marks on Polly’s flesh. Verse Chorus Verse continues through April 7th at side project theatre (1439 W. Jarvis), with performances Thursday thru Saturday at 8:00pm, Sunday at 7pm. Tickets are $15 general admission ($12 for senior/student/industry), and can be purchased online. For more info, go to www.tympanictheatre.org. Photos by Paul E. Martinez.